I have really fond memories of this curry from my childhood. My grandmother used to make the vegetarian version of this curry with lauki for me whenever I used to visit her and used to serve this with piping hot steamed rice. The combination of this curry with rice just creates magic on your taste buds. The midly spiced curry with the flavours of coconut, tamarind, coriander and chillies, just leaves one craving for more. 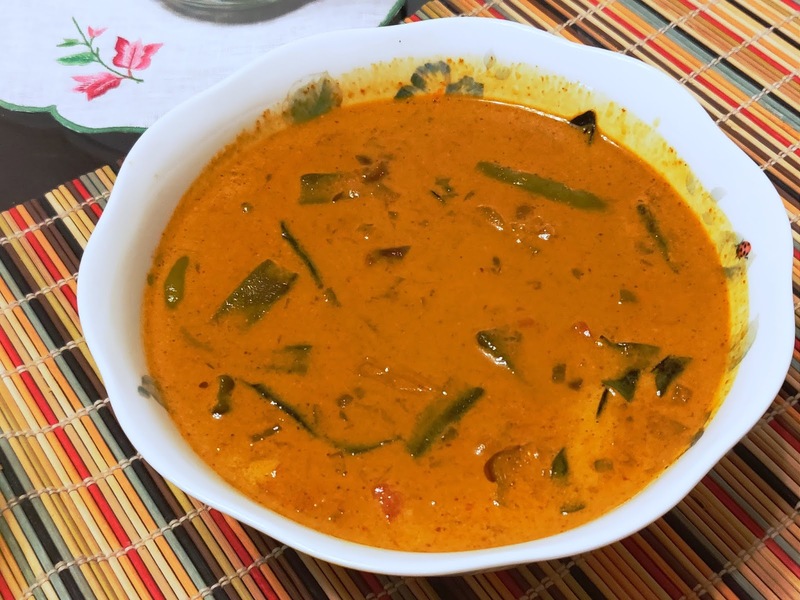 My late grandmother was a native of Goa and so I can vouch for the authencity of this lipsmacking curry which is a basic preparation in every Goan household. As I researched this curry, I got to know that this is a staple during the monsoons when fresh fish is not easily available and hence is usually made with dried fishes and prawns with our without vegetables. Kashmiri red chillies - 5-6 chillies to be ground into a smooth paste with coconut and jeera as given above(Optional - I used 1 tsp of chilli powder instead) The Kashmiri chillies lend a bright red colour to the curry. Saute the chopped bhindies and keep them aside. In a kadhai, prepare the tadka with jeera and add chopped onions to it. Once the onions become translucent, add curry leaves, green chillies and fry them for a while. *If making the recipe using the coconut paste with chillies and jeera, then add this paste to the tadka at this step and saute the mixture till it leaves oil on its sides. Instead of adding jeera to the tadka, add the paste here. Then add the tomatoes and the other dry spices. Again, saute it for a minute or two by adding some salt to bring out the juices from the tomato. To this mixture, add the coconut milk, tamarind pulp, salt, sugar, water to adjust consistency and then bring it to a boil. Traditionally, this is not a very thick curry but feel free to adjust the consistency to your liking. Serve this curry with steamed Goan red rice for an authentic and tasty Goan meal!